Patient. Precise. Deliberate. Cerebral. Disciplined. All words used to describe the University of Virginia’s present-day version of the Mover Blocker Offense and the pace at which they run it. Some of these words are meant as compliments from UVA’s admirers and some as back-handed insults from the Cavs’ detractors. Whether you are a fan of Virginia’s style or not, it’s hard to argue its effectiveness. Barring an upset, Virginia (23-1) will soon be the #1 ranked team in college basketball and appear to be headed towards an ACC title and a top seed in March Madness. What they lack in perceived entertainment value (UVA is 351st out of 351 Division I teams in Adjusted Tempo), they make up for in efficiency. Per game stats do not tell the story of the Virginia offense. On a per possession basis however, Tony Bennett’s squads rank among the nation’s best since his arrival in Charlottesville. A large part of their offense is the pin screen. 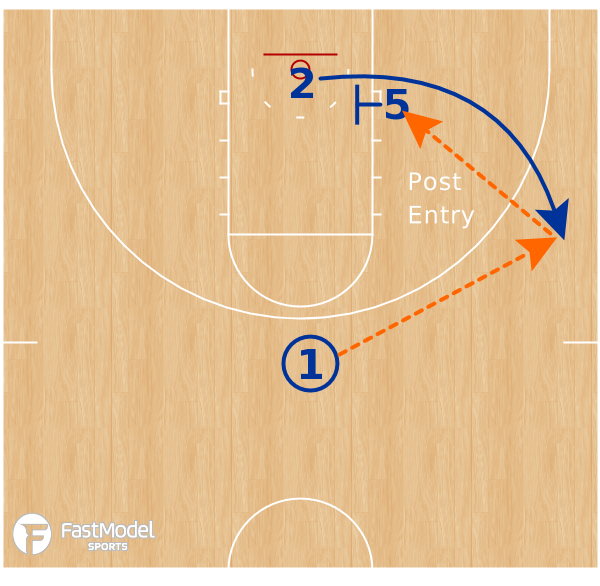 The Virginia guards often exit the lane off numerous bruising pin screens set by a pair of stout screeners working up and down each lane line. Reading the pin screen is a motion offense skill UVA’s cutters have mastered. 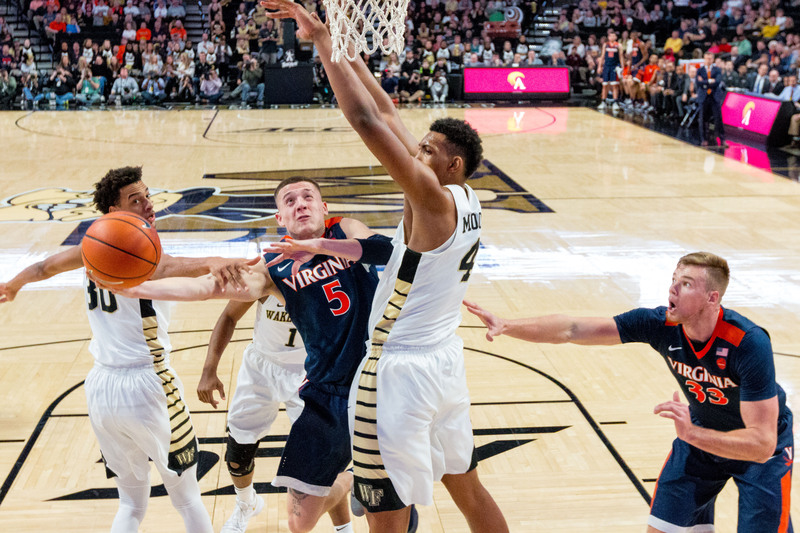 Below we examine pin screen reads with the help of current Virginia guard Kyle Guy and former UVA star Malcolm Brogdon (now with the Milwaukee Bucks). A pin screen is an off-ball screen set along the lane line for a cutter exiting the lane. It is one of the four screens common to motion offense along with the down screen, the flare screen and the back screen. Typically post players set the pin screen. The screening angle for a pin screen is “back to the sideline” with hips parallel to the lane line. There are times when the screener will have a slight inward angle. The objective is to “pin” the cutter’s defender in the lane. The screener should eye the cutter’s defender and slide up or down the lane line to block his/her escape from the lane. The screener backs off the lane line a couple of feet, do not “toe” the lane line. Backing away from the lane line allows the screener more time to see the defender and adjust his/her placement. Get a “double-wide” base and allow the cutter to cut off your hip. Always seal your defender with a post up after setting the pin screen. And remember, the purpose of the pin screen (or any screen) is to create an advantage for either the cutter or the screener. If that happens, use the advantage! Cutters must develop a sense for how their defender navigates the pin screen. If their defender trails, the cutter executes a curl. The most common curl off of a pin screen is the long curl. There are times when a tight curl is an option as well. Tight curls are more common when the screener is backed off the lane line a bit further than the Virginia examples (Frame 1 = Tight Curl, Frame 2 – Long Curl). Below are examples of long curls and tight curls from Guy and Brogdon. You can see how the screeners slide up or down the lane line to “pin” the trailing cutter in the lane or at least widen his pursuit. Often the screener’s hips are parallel to the lane line. The screening posture is “double-wide” to force wider pursuit from the defender. The cutters curl into catch and shoot long curls to the elbow area or slashing tight curls into the lane. The curl cut, like all cuts in motion offense, are reads. They are based on how the defender plays the cutter and not predetermined. Curls are inside cuts often resulting in points in the paint. Curling the screen is the counter to lock and trail defense. There are only so many ways the defender can navigate the pin screen. It is up to the cutter to read it and counter. If the defender goes over the pin screen, the cutter out cuts to the corner. Some coaches call this a “pop cut” or “fading” the screen. On the out cut, the screener sees the cutter’s defender intends to go over the screen (on the halfcourt line side) and slides up the lane line to make his/her escape more difficult. The cutter presses off and out cuts toward the corner. In the video below you see this screening technique. Watch as the cutter’s defender goes “over” the screen and the screener adjusts. This prompts the out cut read from the cutter. It is via out cuts Virginia gets much of its three-point production. It should be noted that since the cutter is out cutting to the corner, the passer may have to “take the ball to the action” with the dribble and leave the middle third of the floor. Shorten the pass with the dribble and throw a strike to the shooter. It is imperative in motion offense that the screener, the cutter and the passer be able to read screens and recognize how they are being defended. Often the defender is hung up on the screen. This prompts the straight cut. The screener sets the screen along the lane line and the cutter exits the lane off the screen “straight” to the wing. Some players have a habit of straight cutting when they should curl or out cut so the straight cut is something you will see often. Design motion drills against live defenders for better recognition. There are options on the straight cut. The catch and shoot is one option. Simply exit the lane off the pin screen, organize your feet and fire on the catch. Fair warning, this is a difficult shot. Guy and Brogdon make it look easy in the video below but to do this well takes hours of practice, great technique and skill. Often the cutter’s defender is out of position when the cutter makes the catch on the straight cut. They are either above or below the plane of the cutter on the catch. In these instances encourage the cutter to use the advantage on the catch and drive it opposite the defender without hesitation. No squaring up or triple threat needed. Anticipate on the catch and go. In the video below, Guy and Brogdon show us straight cuts for catch and shoot three-pointers and catch and go drives. As mentioned, the post player seals their man into a post up after pin screening for the cutter. The straight cut can be a way to set up a post entry. The “Pin & Post” is diagrammed below. The cutter makes the straight cut to the wing off the pin screen and looks inside upon the catch for the sealing post player. Consider making a post “look-in” rule for all straight cuts if you are not blessed with a shooter who can consistently make catch and shoot threes off straight cuts. On any straight cut catch, look into the post. 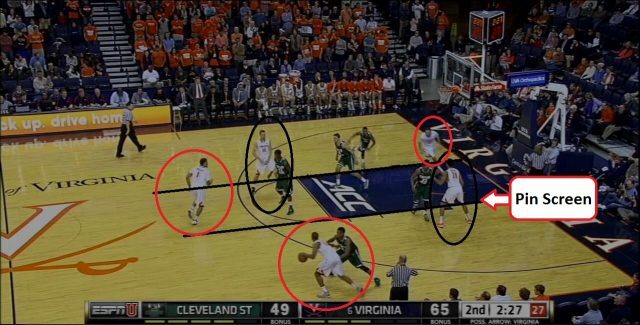 Below Virginia demonstrates the “Pin & Post” to get post touches for their screeners. Virginia has yet to advance to a Final Four during Bennett’s tenure. The lazy reason many cite is Virginia does not have “enough offense” to win it all. Winning in March is much more complex than that. While some may be turned off by the Virginia style and are unwilling to “Embrace The Pace” as they say in Charlottesville, it is hard to argue the Cavs’ ability to stay true to identity. Like it or not, Bennett has forged an identity into the UVA program. One does not have to like classical music to know Beethoven was a genius. You can express distaste for the Bennett’s system but you cannot argue his players near flawless execution of the system (on both ends) including the pin screen reads above. You do not have to watch much Virginia basketball to recognize what Bennett is all about – he is not a coach without a compass. More importantly, you do not have to watch much Virginia basketball to see the UVA players know what their program is all about. How many other programs can you say this about…? 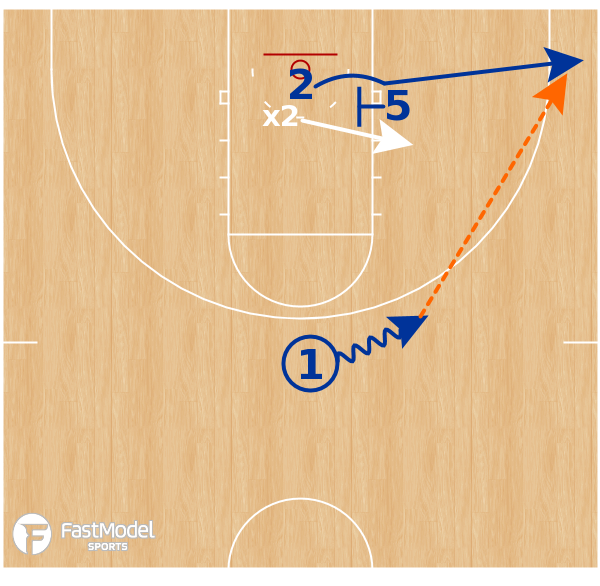 Check out #MotionOffenseTips for more on Motion Offense! For help with practice planning and implementation of a motion offense and other offensive elements for finding, using and creating offensive advantages please reach out and join our community for basketball coaches!